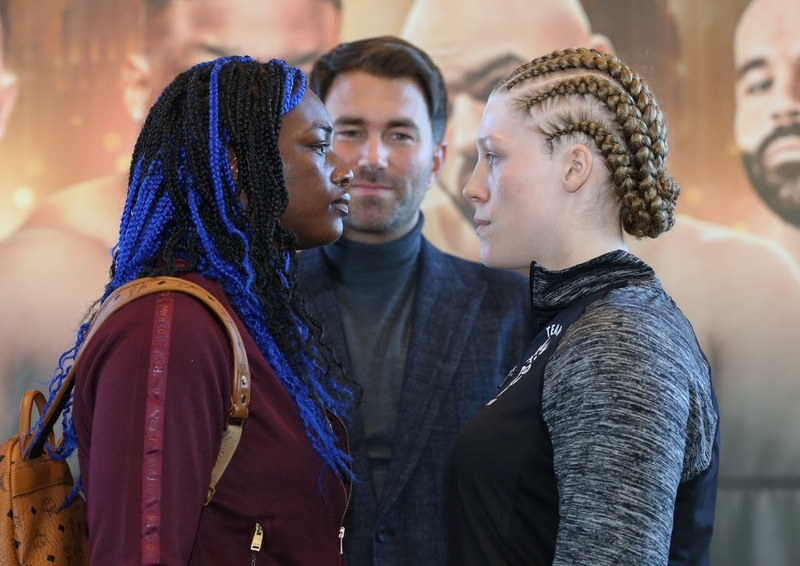 Hannah Rankin believes her team have devised the right gameplan to beat Claressa Shields and claim the WBA, IBF and vacant WBC World Middleweight titles on Saturday night at the Kansas Star Arena in Mulvane, KS, live on DAZN. Rankin meets Michigan ace Shields in her second World title fight, coming into the clash on the back of moving up two weights to take WBA Super-Middleweight champion Alicia Napoleon the distance in New York in August. The 28 year old feels strong at 160lbs as she prepares to face the two-time Team USA Olympic gold medal star, and as a proud Scot, she’s relishing her underdog status. “I’m so excited about the fight,” said Rankin. “She’s one of the top names in the game and that’s why I’ve taken the challenge at the very top level. I’m really looking forward to the fight, we’ve both got aggressive styles and I think it’s going to be great for TV. I hope she brings her A-game as I’m going to bring mine. “I’m a massive underdog and I’m not going to say it any other way, but I can’t wait to get in there and showcase what I can do. We’ve got a gameplan to execute and I am confident that if I stick to it, I’ll hear ‘and the new’. “Being a boxer is a very Scottish thing to do – we’re always the underdog and we love to prove people wrong. I’ve got a big heart and I am a fighter, I always have been. You are always learning in the gym and in every fight and I thrive on that, it’s what attracts me to the sport. “I’m not a trash talker, I’ve worked on my things in camp so she better be ready for me on Saturday as I’m ready to bring it. Alicia was my first ten round title fight and I stepped up two weights for that. I’m outside my comfort zone again but I learnt a lot in my last fight and I’m going to bring all that out on Saturday. Shield’s clash with Rankin is part of a huge night of action in Kansas in association with KO Night Boxing with a host of stars and local talents in action. Middleweight contenders Luis Arias and Gabriel Rosado clash in what promises to be a real war as the pair look to gatecrash the lucrative top table, and there’s an all-Mexican clash and a homecoming for Brandon Rios against Ramon Alvarez, brother of ‘Canelo’, as both men look to make a splash at Welterweight. Team USA 2016 Olympic bronze medal man Nico Hernandez has raced to 5-0 (4 KOs) – the Wichita talent fights for the third time in the Kansas Star Casino and Arena since debuting there in March 2017, unbeaten Wichita Super-Middleweight and police officer Manny Thompson looks to improve his 7-0 record and Las Vegas’ Jeremy Nichols meets Wichita’s Jeremiah Page at Middleweight. Unbeaten Light-Heavyweight contender Anthony Sims Jr. and Brooklyn’s exciting newcomer to the Middleweight scene Nikita Ababiy, fresh from a first round KO on debut in Chicago in October, are also in action.